Home » Posts Tagged "Packet"
How To Obtain A Good Cause Waiver? How To Obtain A Good Cause Waiver – Section 192.2495, RSMo, requires regulated health care employers, such as long-term care facilities, hospitals, home health agencies, in-home services providers and consumer directed services programs under contract with the Department of Health and Senior Services, hospices, and adult day care providers to obtain a background screening prior to hiring an employee. For in-home services providers, consumer directed services providers and home health agencies, this includes checking the Family Care Safety Registry (FCSR) (Sections 210.900 – 210.936, RSMo.). This statute states that an individual with a certain type of finding identified in his or her background screening cannot be hired by these employers. However, in certain circumstances, the individual has the right to apply for a GCW that, if granted, would waive the legal hiring restriction and allow him or her to be employed. A complete Explanation of Background Screening Finding form for EACH arrest/investigation that resulted in the disqualifying offense or incident. Include what happened, how it happened, why it happened, when and where it happened, any person present at the time, and the circumstances from your point of view. Include why you feel your Good Cause Waiver should be approved. Attach one (1) sponsorship letter from a previous or current employer stating how long the person has known you and why they feel you should be recommended for a Good Cause Waiver. If you are unable to obtain a sponsorship letter, submit 3 character references from persons who are knowledgeable of your character and employment history. The reference letters cannot be from someone related to or residing with you. 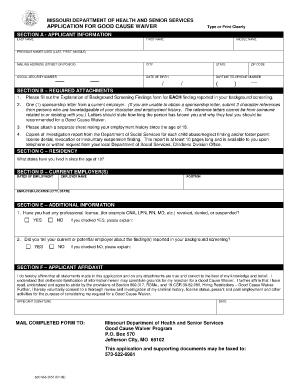 Attach a completed Employment History form noting previous employment since the age of 18. If the disqualifying finding is substantiated child abuse/neglect and/or foster parent denial/revocation/suspension, attach the investigation report from the Department of Social Services (DSS). This report is approximately 10 pages long and is available to you upon telephone or written request from your local DSS office. If you have ever been refused a license, certificate, or registration by any public or governmental licensing board, agency or regulatory authority, explain the incident that led to the disciplinary action. If you have any pending felony or misdemeanor charges, include a statement explaining the circumstances and certified copies of the charging documents for all pending criminal charges. Explain any pending charges or reports of child abuse, neglect or endangerment. Explain any pending actions that might result in the denial, revocation, or involuntary suspension of a foster parent license. Explain any pending actions that might lead to your inclusion on the Department of Mental Health Employee Disqualification Registry. Any documentation that, in your opinion, supports your application for a GCW by demonstrating rehabilitation, positive lifestyle change, etc.